Modern washing machines come with quick-wash features, special cycles for delicate clothes, water saving programmes, and many more convenient and energy-saving innovations. Shop our wide and varied range below! At Ship It Appliances, we stock a selection of washing machines to suit everyone, from young professionals who need to wash work clothes several times a week to busy parents struggling to keep up with cleaning sports kits and school uniforms. These washing machines will keep your clothes clean and looking like new as well as tackle large loads of heavily soiled clothes with ease. Our selection includes both free-standing washing machines and integrated models. Our high capacity models can accommodate loads of up to 9kg, and we also offer smaller models with ultra-fast washing programmes or special wash cycles for people with allergies. Whether you need to wash cottons, synthetics, silk, wool, or sportswear, we have the right machine for you and your household. Choose from machines with A rated energy efficiency, low water consumption models and high capacity twin jet washing machines. We stock machines in a variety of colours, so you can choose a design that will complement the existing appliances and units in your kitchen. Many of our washing machines come with a five-year warranty and we also offer free shipping to 99% of the UK. Give us a call today if you would like to discuss your washing machine needs. 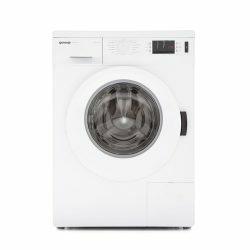 We also offer tumble dryers and combination washer dryers, or you can view our full range of laundry appliances here.